Nearly Matches The Power Of Dynomation-6 At 25% Of The Cost! DynoSim6 and Dynomation6 share the same User Manual. Low-Cost, Wave-Assisted Analysis, High Accuracy, Packed With Features For The Serious Engine Enthusiast! DynoSim6™ With ProTools™ is a highly accurate engine-dyno simulation, built from the ground up for the IC engine enthusiast. DynoSim6 is so easy to use that you’ll be building horsepower with this simulation in just minutes. Assemble and evaluate any engine you can imagine. Click on and change any component, select from pop-up menus or enter your own custom specs. DynoSim6 instantly displays power and torque, fuel flow, airflow, frictional losses, and much more! Use wave-dynamic displays from Dynomation-6 to “see inside” your running engine! Minimize intake reversion, correct miss-timed exhaust pulses, locate flow restrictions. This software also models turbochargers, roots/screw and centrifugal superchargers. Set boost, belt ratios, turbine sizes, A/R ratios, even model intercoolers. And you can count on Motion Software for top-tier technical support to help you if you need it! 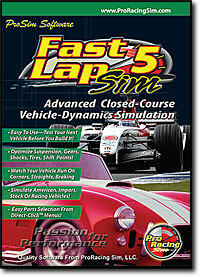 DynoSim6 is, simply, the most simulation for the money, and it’s fun to use, too! We Guarantee it! • Also Available In A Discount Bundle! Full Sim Package With Free CamFile and Lobe-Profile Libraries! Inexpensive Engine Simulations With Power, Accuracy! 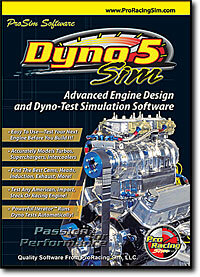 DynoSim5™ with ProTools™ is our previous-version engine simulation (before the release of DynoSim6, described above). While it does not include the new features in Version-6 simulations, DynoSim5 offers great value for the money. Take advantage of the new low price and put this accurate engine simulation in your tool box today! DynoSim5™ will help you find hidden power in any domestic or sport-compact engine. If you want to get the most from your next engine project on a limited budget, the powerful features of this simulation will help you optimize performance and keep costs down. Version-5 includes hundreds of engine-design options for you to draw from: induction modeling with forced induction choices, detailed camshaft modeling, ignition modeling, combustion modeling, rocker-ratio math, expanded results graphs and tables, comprehensive printouts, full compatibility with other Version-5 simulations, automatic updating over the web, and much more! Put the latest in Sim technology to work for you today. Add 6000+ Popular Cam Files To DynoSim5! 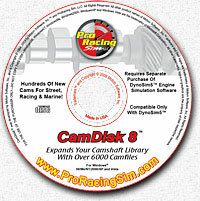 CamDisk-8™ is a camshaft simulation file library that expands the files supplied with DynoSim5 (DynoSim6 includes this library). This CD includes over 6000 camfiles and specifications from top Cam manufacturers around the World! The data has been carefully researched and organized so that you can find the optimum cam for your application in just minutes. Expand DynoSim5 to full power with CamDisk-8! Note: CamDisk-8 will only function properly with DynoSim5. Do Not Purchase This Product If You Intend To Use It With DeskTop Dyno5, DynoSim6, or Dynomation-6 Engine Simulations. 6000+ CamFiles Expands DynoSim5 Cam Library! Finding the best chassis setup, gear ratios, shift points, and optimum settings for hundreds of other components needed for winning street or drag-strip performance can be an expensive, trial-and-error process. With DragSim5™ with ProTools™ enthusiasts and pros can quickly build and drag-test any vehicle imaginable, including automobiles, dragsters, motorcycles, even front and rear-wheel drive vehicles! Test any engine power curve, manual or automatic transmissions, any gear ratio, any vehicle weight, wheelbase, driving style, weather conditions and more! Change components with just a mouse click—drag-race times are instantly updated. A PopUp TimeSlip™ provides an easy-to-read visual summary of overall vehicle performance. Nothing could be easier! DragSim5™ also includes a sophisticated Traction Calculator™ that optimizes tire/track modeling and improves accuracy. Compatible with all our engine simulations. DragSim5™ is amazingly accurate and fun to use! Racing a road-course vehicle is a never-ending search for the perfect combination of suspension, tires, gear ratios, braking points, steering path and a hundred other variables needed to arrive at the winner’s circle. Thanks to FastLapSim5™ with ProTools™ road-race enthusiasts and pros can accurately test vehicle components, try unique combinations and evaluate the entire vehicle on any closed-course—all without twisting a single wrench or buying any parts! Select from any of the 40+ built-in tracks, skid pads and slaloms. Use the powerful Track Editor™ to add more tracks or design your own custom track layouts. Finds the optimum driving path and precise braking points through every turn and straightaway. FastLapSim5™ is remarkably accurate and great fun to use. Guaranteed to improve the handling and performance of your next project vehicle. Includes ProTools™ for Track Segment analysis, High-Resolution Testing, Real-Time Sim Calculations, and much more. Easy-To-Use, Low-Cost Engine Simulation Known Worldwide For Accuracy and Modeling Power! 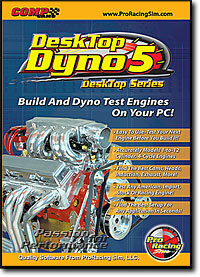 The DeskTop Dyno5™ is an easy-to-use, engine-dyno simulation that offers amazing predictive accuracy and low cost. DeskTop Dyno5 allows any performance enthusiasts to test camshafts, cylinder heads, compression ratios, valve sizes, intake manifolds, fuels, nitrous oxide, exhaust systems and so much more! In seconds, you can enter your engine specs using our simple Direct-Click™ interface. Then watch the simulation display power and torque curves within a few percentage points of actual dyno data! Effortlessly test an unlimited range of part combinations. No other simulation software compares in low cost, features and accuracy. Get the most simulation power for the money, bar none! 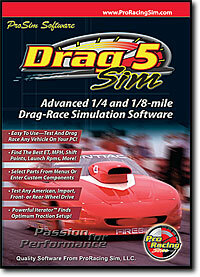 Easy-To-Use, Low-Cost Drag-Race Simulation Known Worldwide For Accuracy and Modeling Power! 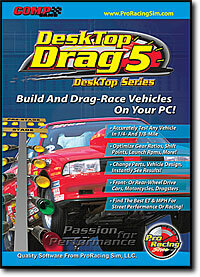 DeskTop Drag5™ vehicle simulation lets anyone test any vehicle on an 1/8- or 1/4-mile drag-race track. You will instantly see the performance potential of any automobile, dragster or motorcycle. The simulation displays component parts on the left side of the screen and race results on the right. Direct-Click™ menus allow the quick selection of parts and vehicle specifications. Test a virtually unlimited range of engine power curves, transmissions, gears, clutches, torque converters, launch and shift rpm, aerodynamics and more. Results displays include acceleration, engine speeds, clutch and tire slippage, elapsed times, and vehicle speeds! Provides high accuracy at remarkably low cost. Fully compatible with all our simulation engine files. No other drag-racing or vehicle-simulation software compares in low cost, professional features and accuracy. Easy-To-Use, Low-Cost Road-Course Simulation Known Worldwide For Accuracy and Modeling Power! 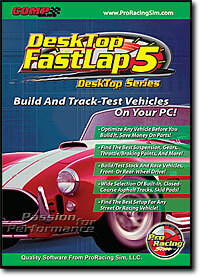 DeskTop FastLap5™ will analyze the handling ability of any vehicle on any closed-course, asphalt track. Despite its low cost, DeskTop FastLap5™ performs a comprehensive turn-by-turn analysis of any front or rear-wheel drive vehicle to help you find the best setup for any of the 40+ built-in tracks. Use the powerful Track Editor™ to add more tracks or even design your own custom track layouts. Tracks can be any length, varying widths and have any number of turns. Advanced simulation techniques calculate an optimum driving path and precise braking points through every turn and straightaway. Watch as your vehicle negotiates each turn. You can easily detect oversteer, understeer, and other handling abnormalities. Easy-to-read graphs detail full vehicle telemetry including acceleration, braking, steering degree, engine power level, and much more at each point on the track. Determine lap times to within a few percentage points of true track-test data. There is no other closed-course simulation that compares with the DeskTop FastLap5™ in low cost, features and accuracy. ON-LINE ORDERS: You may place your order directly on this website. We use high security in our store; your data is protected. You will be promptly notified by email that your order was received. We will keep you up to date on the status of your order and when it has been shipped (usually within 24 hours or less). PHONE or FAX ORDERS: Call (901-259-2355) to place your order, or Fax (901-375-3443) you can Fax a copy of your Shopping-Cart page to our Order Desk. All prices are subject to change. ProRacing Sim, LLC., reserves the right to change any products, product specifications, or pricing at any time without obligation to notify anyone of such modifications or changes.